This has been a long, harsh winter in our part of the country, and we’re eager for signs that it is over. The change to daylight savings time coming up for us next weekend means one less hour in the day, but it’s worth it to know that snow and ice will soon be behind us. 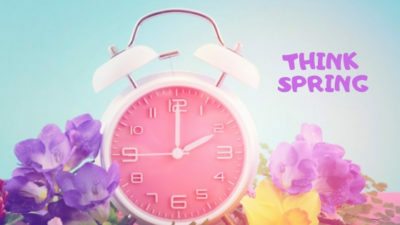 Daylight savings time itself offers several opportunities for promotions. If you sell clocks, this is a great time to use an image such as the one accompanying today’s blog to bring home that fact. And since many people replace the batteries in their smoke detectors when daylight savings time starts or ends, why not offer free batteries to the first 20 customers on Sunday? Accompany this offer with a public safety announcement about the importance of having smoke detectors with fresh batteries. This is a great time to do some spring cleaning, and encourage your customers to do the same. Invite them to “KonMari” their home, and bring in a certain number of clothing or household items, or books, that no longer spark joy. You can then give their donation to charity, and offer a 10% off discount on whatever replacements they select. Spring is of course a time of new beginnings, and even if you’re in an area that doesn’t have a dramatic change of seasons, it’s a great opportunity to roll out new merchandise. Garden and floral items signify spring no matter where you are, and the scents of spring are also an effective way to freshen the store. Post photos on social media, especially Instagram, of your new displays – you want to make shoppers excited to come in to see your new look.